I couldn’t resist sharing this Wales Online article which features the fantastic artwork of 35 year old American Christie Cox. 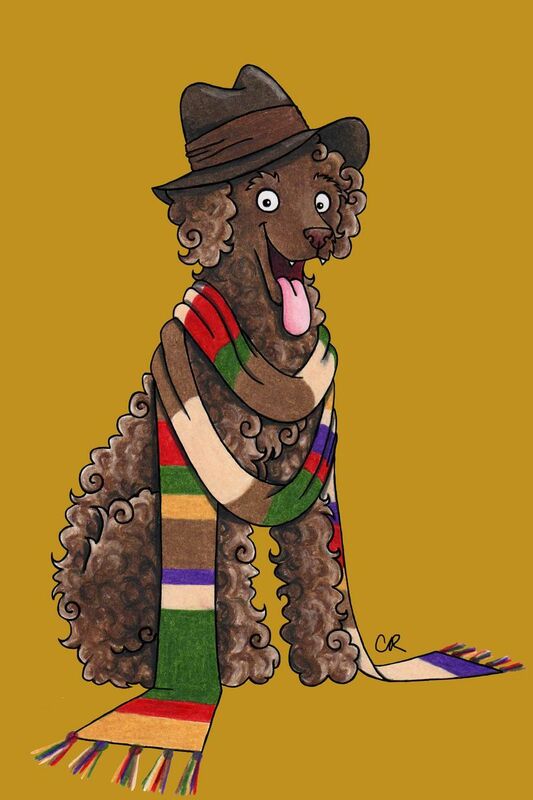 Cox has reimaged all 13 incarnations of the Doctor as dogs. You can read the article and view all of the artwork here. After a long 50th Anniversary induced break it’s back to the Doctor Who Mind Robber’s journey through all 800 episodes of Who. Today we farewell the Second Doctor, Patrick Troughton, as Season Six concludes and we inch towards Jon Pertwee’s debut as the Third Doctor. Please join us as we explore Season Seven of Doctor Who and meet the Silurians and Autons for the first time. Following the stellar success of the Doctor Who Symphonic Spectaculars in Melbourne and Sydney in 2012 and 2013, Brisbane was blessed with its first performance of the Doctor Who Symphonic Spectacular (DWSS) on Saturday 8 February. 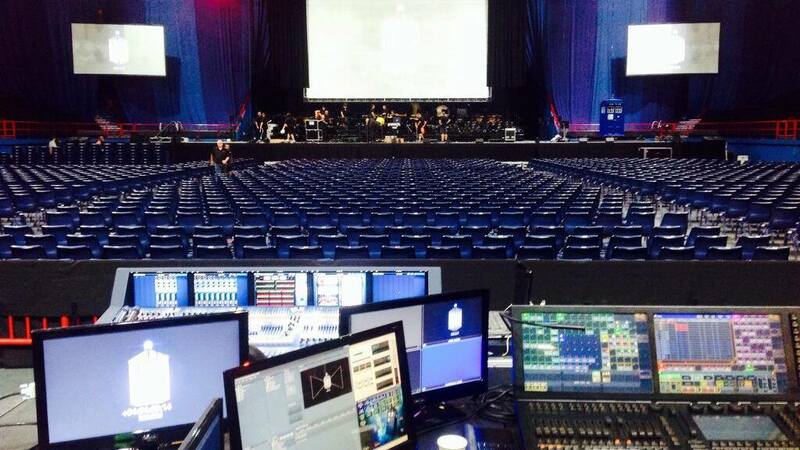 These concerts have their genesis in the UK’s Doctor Who Prom. Proms have been held in 2008, 2010 and 2013 and this DWSS was modelled upon the third and most recent Prom. The DWSS is not, however, a travelling roadshow from the UK. Although the Conductor, Ben Foster, is responsible for the orchestration of Murray Gold’s compositions and has conducted the UK Proms, the orchestras, choruses and soloists are home grown. This is Doctor Who with an Australian accent. Having each city’s own Symphonic Orchestra perform has been an inspired choice and has afforded audiences the opportunity to experience their own Symphony Orchestras, perhaps for the first time. Reviewers who have seen multiple DWSSs in different cities attest to the subtle differences in interpretation given to pieces by each respective orchestra. 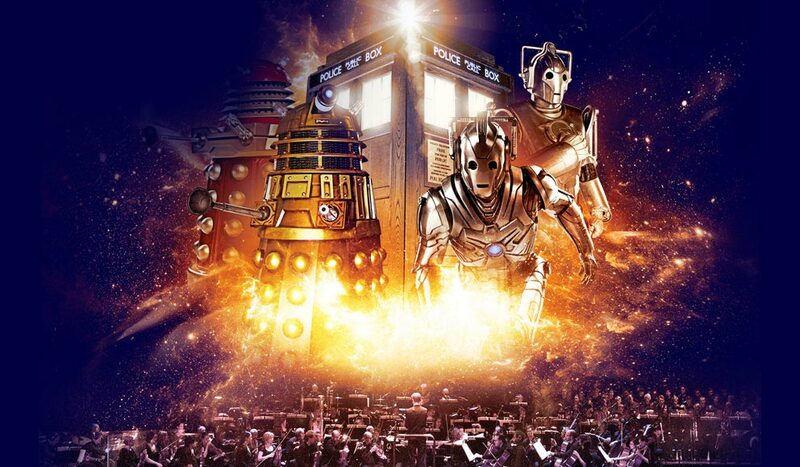 Moreover, the DWSS has introduced the symphonic musical genre to a multitude of concert goers and schooled four symphony orchestras so far (Sydney, Melbourne, Queensland and New Zealand) in the musical delights of Doctor Who. The Queensland Symphonic Orchestra performed in the Brisbane Spectacular. The QSO is Queensland’s only professional symphony orchestra and employs 88 full-time musicians. Performing over 100 live performances per year, the QSO is seen by around 100,000 people annually. Given the 8,500 in attendance at the Brisbane Entertainment Centre, that’s almost 10% of the Orchestra’s yearly audience in one night! The QSO announced on its Facebook page that the Brisbane Spectacular was performed before the largest audience yet for a DWSS. 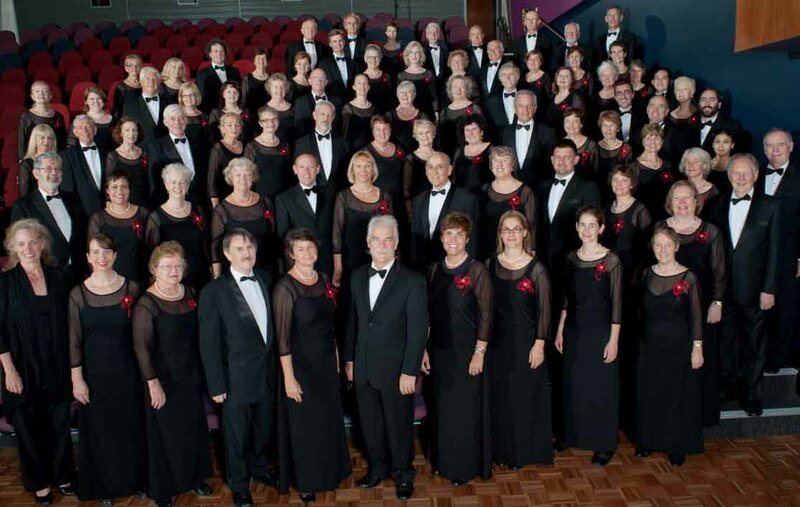 Brisbane Chorale provided the vocals and is an independent incorporated association which was originally formed under the auspices of the Queensland Conservatorium in February 1983. Comprising of over 100 voices, this choral music ensemble regularly performs with the Queensland Symphony Orchestra. Peter Davison hosted the Spectacular and his entrance onto the stage was met with rapturous applause. 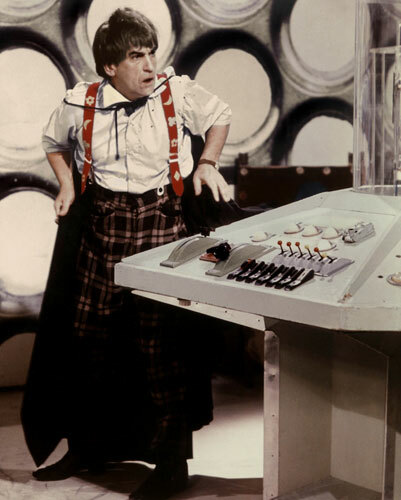 Introducing himself as the Fifth Doctor, Davison advised the audience that they could just call him “005”. Lamenting the English cricket team’s demise in the recent Ashes series, he hoped the audience would be kind enough for him to cancel his taxi booking for a quick exit to the airport. The Fifth Doctor, who alas was not dressed in his Doctor Who garb, joked about mobile phone messages and texts between himself and former companion, Janet Fielding, who was born in Brisbane. Later Davison did his best to plug the meteoric Five(ish) Doctors Reboot without seeming to do so. The 30 minute faux reality piece featuring the Fifth, Sixth, Seventh and Eighth Doctors is still available to view on the BBC website. 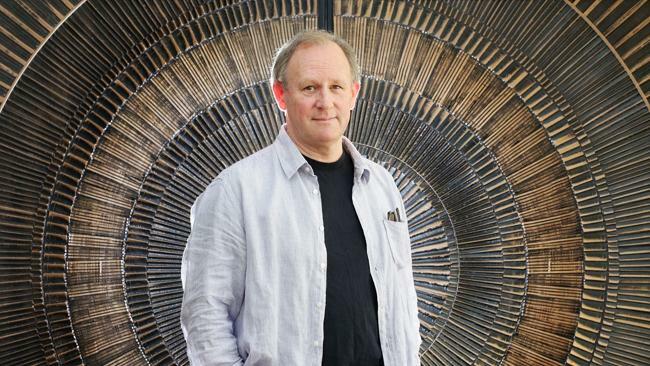 Peter Davison. Picture by Liam Kidston. Source – News Limited. As an “Old School” Doctor Who fan one of the highlights was the Classic Doctor Who Melody. Clocking in at an all too short 8 minutes, it featured musical interpretations from The Daleks, The Tomb of the Cybermen, The Sea Devils, City of Death, Logopolis, The Five Doctors, The Ultimate Foe and The Curse of Fenric. Commencing with the TARDIS’s idiosyncratic materialization sound and a quick photo of Delia Derbyshire, the genius who realized the theme, the First Doctor and Susan are then seen to be accosted by a Dalek. Having been greeted upon entering the Brisbane Entertainment Centre precinct with Martin Slavin’s sublimely eloquent Space Adventure it was with immeasurable pleasure that I became immersed in the short extract presented here. Space Adventure was the Cybermen’s theme in the Second Doctor adventures The Moonbase and The Tomb of the Cybermen. The piece received its final Who outing as the Yeti’s accompaniment in the recently recovered six part serial The Web of Fear. Visually this musical masterpiece was accompanied by the chilling emergence of the Cybermen from their icy graves in The Tomb of the Cybermen – an iconic moment in Doctor Who’s history, if ever there was one. Listen to the original Space Adventure in full in the link below. The Second Doctor’s encounter concludes with a second generation Cyberman delivering their 1960’s catch phrase – “You will be like us”. A short visual interlude ensued of the Third Doctor and the Sea Devils (now that’s a monster that needs reviving! ), followed by an extended exploration of Paris with the Fourth Doctor and Romana II. The Fourth Doctor regenerates to the Fifth surrounded by images of companions, (then) present and past, followed by extracts from The Five Doctors. It was also a delight to see the Sixth Doctor’s response to Peri, “Change my dear. And it seems not a moment too soon”. The Seventh Doctor and Ace concluded this sentimental journey. Tom Baker’s inclusion in two pre-taped video presentations was a delightful bonus. Described by the host Peter Davison as balmy as ever, Baker regaled the audience with the tale of his pre-dawn stealth drive from Suffolk to Cardiff for four hours of filming with Matt Smith for the 50th Anniversary Special, The Day of the Doctor. The full two and a half minutes of Baker’s cameo as the Curator accompanied the music from the serial and met its conclusion with rapturous applause. Nods to Classic Series Who were also evident in visual accompaniment to The Name of the Doctor. Undoubtedly my favourite aspect of Series 7 was Clara’s dream like encounters with all of the Eleventh Doctor’s predecessors in the season finale. It was such a delight to see that segment cast upon the big screen. Amongst the works of composer Murray Gold performed where I am the Doctor which visually incorporated the Doctor’s speech from The Pandorica Opens and The Companions, a medley of themes for companions Rose Tyler, Martha Jones, Donna Noble and Amy Pond. Interestingly, it was Donna’s theme that received the greatest applause from this Brisbane audience. Clara Oswald’s theme was celebrated in The Impossible Girl. Cyber Shard included music from The Bells of Saint John and Nightmare in Silver, whilst The Rings of Akhaten featured the vocals of soloists Lauren Elvery and Iain Henderson. 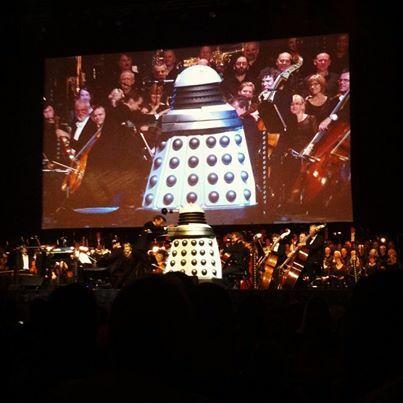 The Daleks, who did not appear in person until after the intermission, denounced conductor Ben Foster’s over-acting prior to the orchestra launching into First There were Daleks, a suite of music from various Dalek serials. Song for Fifty, sung by the Soprano, Antoinette Halloran, celebrated Who’s 50th Anniversary. Antoinette had earlier provided a soaring rendition of Abigail’s Song (Silence is all you Know) from the 2010 Christmas Special, A Christmas Carol. Referring again to the Classic Series, Vale Decem featured clips from the Doctor’s regenerations. The Doctor Who production office’s Golden Anniversary output permitted the audience to at last see snippets from the regeneration of the Eighth Doctor to the War Doctor (John Hurt) thanks to the minisode The Night of the Doctor, and the War Doctor to the Ninth in The Day of the Doctor. In an economically packaged masterstroke Steven Moffat has rendered complete the transition from classic to current era Who. 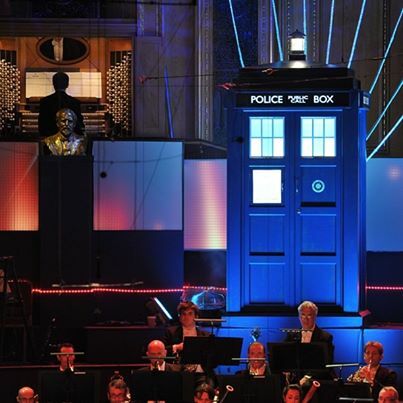 Just when the audience thought that they’d leave the Spectacular without a rendition of the Doctor Who Theme, the orchestra and choir concluded the programme with a very short one and a half minute rendition. Compared to the televised symphonic presentations of Doctor Who, the monsters’ presence in the Brisbane DWSS was a little light on. Gracing the auditorium were Daleks, Judoons, an Ice Warrior, the Silence, Cybermen, Ood, Whispermen, Vampire Girls, Silurians and a Weeping Angel. Needless to say none of them reached my seat in the far outreaches high above the stalls, however those fortunate enough to be accosted by the monsters appeared well pleased by the experience. The audiences response to the Spectacular was overwhelmingly positive. A new generation was introduced to symphonic orchestras and all were left hoping for the return of the DWSS to Brisbane in the near future. As previously indicated, some of the musical selections played in breaks before and after the show were quite a delight. Together with the aforementioned Space Adventure fans of the monochrome era of Who would have recognized Colonial Dance from The Macra Terror and The Ballad of the Last Chance Saloon from The Gunfighters. I was left wondering how many others amongst the eight and a half thousand in the audience knew these hidden gems. With the hysteria of Doctor Who’s 50th Anniversary behind us, and Peter Capaldi’s debut series as the Doctor at least six months away, it’s time to recommence the Doctor Who Mind Robber’s ultimate marathon. 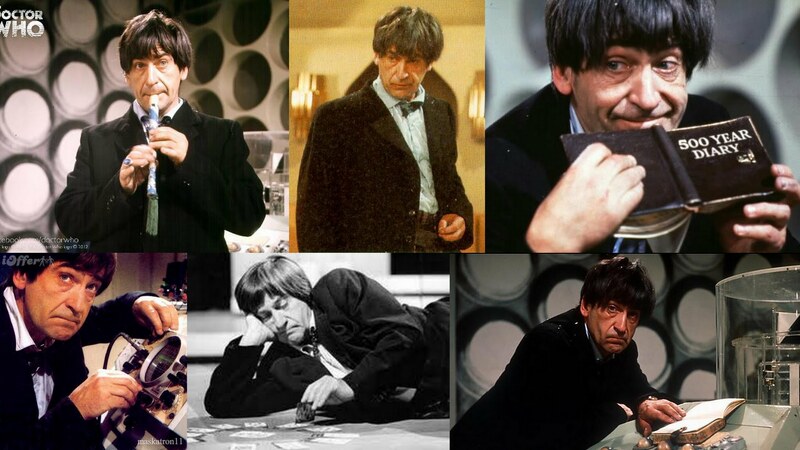 Before the unrelenting barrage of Golden Anniversary publicity and hype derailed the writer’s quest to view and review all 800 episodes of Doctor Who, this humble blog had chronicled the Doctor’s adventures from William Hartnell’s debut serial, An Unearthly Child, to Patrick Troughton’s penultimate outing, The Space Pirates. Although the final serial of the monochrome era, The War Games, had been viewed several times, the review has yet to grace the pages of this blog. It’s almost as if I couldn’t bare to make the final break with my favourite doctor, Troughton. Alas, it’s time to move on. 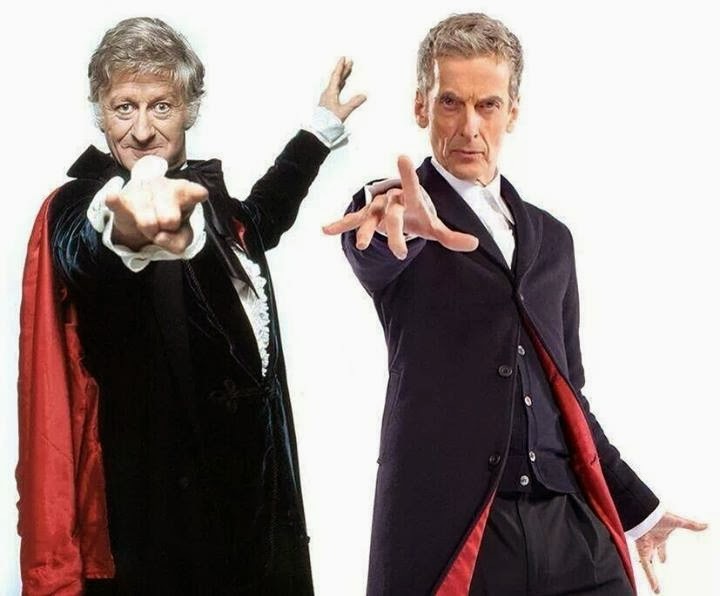 Peter Capalid’s channelling of Jon Pertwee’s Third Doctor in his costume publicity photos has reignited my passion to explore the tenure of our first full colour Doctor. Please join me for the journey! Tickets are still available for Culture Shock Events’ “Lords of Time 2” in Brisbane tomorrow, Sunday 15 December 2013. Commencing at 9.00 am at Pullman Brisbane King George Square, the convention features the Second Doctor’s companions Frazer Hines, Deborah Watling and Wendy Padbury, the Third Doctor’s UNIT companion Richard Franklin, Fifth Doctor companions Nicola Bryant and Mark Strickson, and Eight Doctor companion Daphne Ashbrook. The Eight Doctor, Paul McGann, is also appearing. Tickets are available at the door. The Doctor Who Mind Robber will be in attendance tomorrow to report on proceedings. In the meantime, enjoy some of the Twitter highlights from today’s Sydney convention. All our guests and staff have Safely landed in #brisbane so see you all tomorrow for #lot2 !! It’s the 50th anniversary of Doctor Who!!! Whovians everywhere are excited to see what the newest Doctor will bring to the character, and that got us thinking: what makes the Doctor, THE Doctor? 11 different doctors have played the role over the past 50 years, and each was unique, with different personalities and characteristics. But besides the physical symbols surrounding him – the Tardis, the sonic screwdriver- are there larger cues that indicate the man is in fact THE DOCTOR? Watch the episode and find out! A fantastic animation by Richard Swarbrick celebrates 50 Years of Doctor Who.